CARMEL, N.Y. – Putnam County Executive MaryEllen Odell announced openings in Just Add One Westchester-Putnam, an entrepreneurial course, sponsored by the Westchester Putnam Workforce Development Board, designed to help participating small businesses grow and contribute to the economic growth in the region. The deadline to submit an application for enrollment is Tuesday, Dec. 1. The course is open to small business owners in Putnam County or Westchester County who are interested in learning to create strategies to strengthen their business models/operations and become more efficient. Just Add One Westchester-Putnam, is a 12-week course which covers: goal achievement and accountability; leadership, branding, marketing/public relations, customer services and customer loyalty, websites and social media, accounting, being the CFO of your business, access to capital, sales, legal and human resources/risk & insurance. In addition to weekly class sessions, entrepreneurs will participate in: One-on-One Coaching Sessions During the course of the program, entrepreneurs will participate in weekly coaching sessions to review what they learned in the classroom and to create a strategy for how to apply it to their business. These sessions can take place in person or by telephone. There will also be optional group sessions once a month. Participants will be invited to take part in a group session to identify business challenges and find solutions through peer-to-peer sharing. The course will be held on Thursdays from 6 to 9 p.m. beginning Thursday, Jan. 7, 2016 at Westchester Community College in Valhalla, N.Y.
To be eligible a business must have a growth goal that enables it to hire at least one person. Interested businesses without any employees will be considered only if they have demonstrated business capabilities and an interest in hiring an employee. Business selection is limited to qualified applicants. Applications are due to Just Add One Task Force by Dec. 1. The Task force will select 35 businesses to participate. Candidates will be notified by Dec. 20. For the participants the course costs $163 (includes $13 registration fee and $5 non-refundable fee). The balance of the tuition is being funded by a grant from the Westchester Putnam Workforce Development Board. The Westchester Putnam Workforce Development Board provides policy directions and program oversight to the One-Stop Career Centers and workforce development programs in Westchester and Putnam counties to meet the needs for a highly qualified regional workforce. It strengthens partnerships with business sectors, service providers and the public education system to offer career services and various training modalities to youth and adults. For questions about the course, call 914-606-5685 or email at romina.ganopolsky@sunywcc.edu. Apply for the course online at www.sunywcc.edu/g2e. 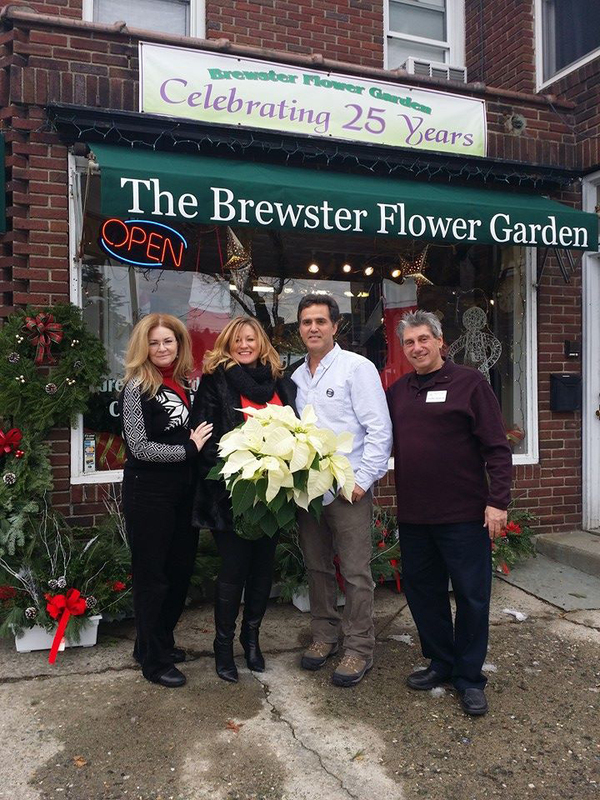 Photo caption: Putnam County Executive MaryEllen Odell with small business owners Jenn Maher, partner of J. Philip Commercial Group and chairwoman of the Putnam Chamber of Commerce, Mark Buzzetto, owner of Brewster Flower Garden, and Geoffrey Reinwald, president of Brewster Chamber of Commerce and associate agent of Fucito Insurance Agency.